As someone that has normal to oily and acne prone skin, battling breakouts is the bane of my existence. Thankfully as I get older they tend to happen less frequently and only around my chin area (typically due to hormonal changes). But there are those rogue ones that pop up unannounced on the rest of my face from time to time - and always on a day that I need to look put together. Ugh! While I've tried a ton of products over the years, there are a few that I go back to over and over again to help me treat breakouts and also prevent them. 1. Ren Bio-Retinoid Cream - I cannot believe I forgot to photograph this one! I brought the bag of products with me outside to take pictures and left this one in the bag. GRRR! This cream is probably my single most effective tool at fighting breakouts so I had to mention it first. Now I should preface this by saying, it is not an acne treatment or product designed to help with pimples. However, I have found that it does wonders for me in treating and preventing them! It is a standard anti-aging cream, but when I first began testing it out I noticed my skin stayed clear for as long as I used it. Not a single bump. And after I had switched to another moisturizer, I began using it as a spot treatment for any blemishes that popped up. It helps heal them incredibly fast and now I never travel anywhere without it. I am already on my second bottle and will never be without this product! 2. iS Clinical Cleansing Complex - Most acne face washes are foamy, strip my skin and make it feel tight and ultimately more oily. This was not the case with this cleansing complex. It is gentle yet effective at helping keep my skin clear, and does a great job at helping heal my skin if I am having a breakout. That was the major difference for me when using this cleanser versus other acne fighting cleansers - the ability to heal the skin when having a flare-up. 3. Paula's Choice Skin Perfecting Liquid 2% BHA Liquid - I love a good acid toner, but not all are designed to help treat or prevent breakouts. When I first tried this Skin Perfecting Liquid, I wasn't sure what to expect but knew the reviews were stellar. After only one week, I began to see a difference. My pores appeared much smaller, any forehead bumps I had were completely gone and it helped reduce a cystic blemish on my chin quickly. I don't feel the need to use it all the time, so I rotate it in and out of my routine when I am feeling particularly oily or suffering from ongoing breakouts. I use it after I have cleansed but before I apply my serums and moisturizers. 4. 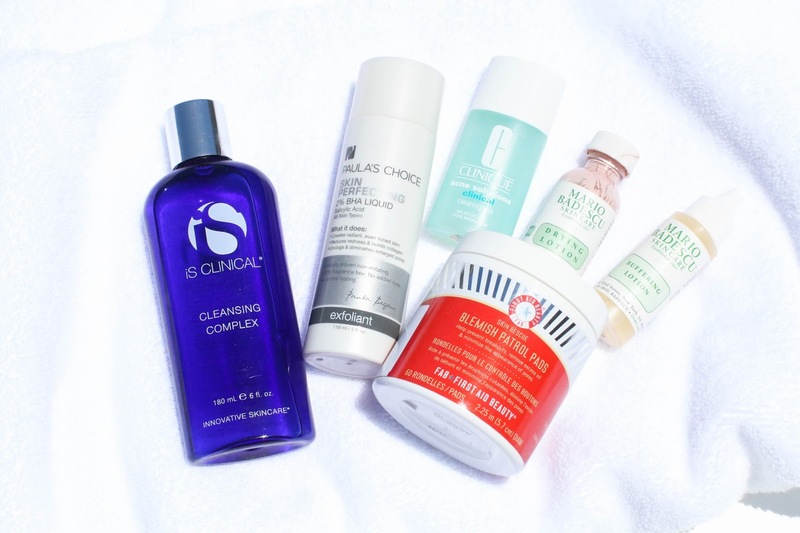 Clinique Acne Solutions Clinical Clearing Gel - Though I have a few products that help to treat the entire face, I still find it helpful to have spot treatments in my skincare collection. This Clinique gel is quite strong (it will sting just know that), but when I need a blemish to come to the surface (gross I know, but true) I will apply this and it draws it out much faster. 5. Mario Badescu Drying Lotion - This was my first ever acne spot treatment I tried because before blogging I was using proactiv for many years. I had heard this lotion was magic in a bottle and I couldn't agree more. Quick tip - do NOT shake the bottle - simply dip a q-tip all the way down into the pink sediment and then apply to the skin. I find that it works best on whiteheads or blemishes that have already made it to the surface. Anything more cystic or underneath needs the next product. 6. Mario Badescu Buffering Lotion - This is what I reach for when suffering from a cystic blemish under the surface that just won't come to a head (again, gross) or won't shrink. It will take a few days for it to go away, but it definitely helps my painful cystic bumps heal much faster. 7. First Aid Beauty Blemish Patrol Pads - After using these pads from First Aid Beauty and falling in love with them, I was intrigued to try the ones for blemishes. Thankfully I was having a breakout when I went to test these so I could get a true reading on their effectiveness. I tried using these alone without any other acne treatments to see if they would work on their own and I was shocked at how many blemishes cleared up after only a few days. There were some pimples that still needed a spot treatment, but these pads help to keep my skin clearer for longer without drying it out. I can use these twice a day, every day and my skin never feels tight, dry or sensitive. I have been through 4 tubs of these already and always have a backup. Hope this post was helpful and one that you can refer back to you if needed. 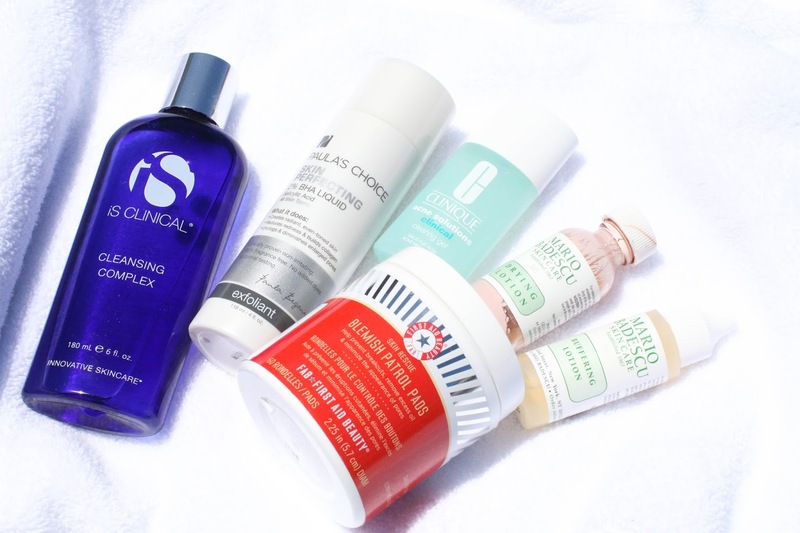 Let me know what acne fighting products are your favorite and most effective! I've been having good luck with benzoyl peroxide for my more cystic acne. I think more so than the buffering lotion. I'm not sure if that one does anything for me personally. And I also really like the MB drying cream. My few bits of acne also tend to be around the chin and tend to be more cystic. I occasionally get whiteheads on my forehead but they're tiny and clear up so quickly. Thankfully. I love Drunk Elephant glycolic serum if I feel like I'm getting a lot of little white heads on my forehead and nose. It helps clear it up really quickly. And I don't find it harsh personally.